Great Tournament! That is the conclusion I take from many of the comments heard at the convention, such as these. "This is the best game of Advanced Civilization that I have ever played." This game is a lot better than the ones we play at home." I really like this well organized tournament." "I am going to play both days since I am having so much fun." "Joe, you did a good job as GM." The 2004 tournament filled 42 positions with 37 different players, 23 in heat 1, 19 in heat 2 and five repeaters. These numbers allowed us to have three games in each heat. A historical perspective on the participation in this tournament can be seen in the following table. The increase in the number of players in the tournament is a welcome sight. This year, I changed a few of the rules. Seating was changed from a semi-random assignment based on skill level to a random assignment to a designated table. A few trade cards were added to the lower numbered decks to help expedite trading, since this year the optional rule of purchasing from any deck was discontinued. Those players with more than two calamities after trading were required to discard calamities for which their nation was immune prior to selecting the calamities by which their nation was affected. This rule was intended to spread out the calamities a little more and did not have a noticeable effect in the three games which I played. Lastly, the kicker or bonus score for each player was intended to measure the efficiency of an empire and was equal to 18/nation average city count. One of the things I appreciate about playing Advanced Civilization is the somewhat absurd and funny comments made by the players during the game. These comments seem to abound in this type of long lasting multi-player games that require a lot of player interaction combined with physical, mental and emotional fatigue. Here are some of the comments that made me laugh this year. "I will only trade for a pair of gems" (stated when the nations first reached five cities). "Thank God, I only got Civil Disorder." "Talk to me when you want that 245 point set." "No matter what you do, sacking one of my cities will not make me happy." The championship game this year had a few new faces which made for a more interesting game and provided some uncertainty for those players frequently in the final. The game started with the typical negotiations for territory and rapid expansion. Africa successfully negotiated for control of Sicily. Iberia negotiated for control of Rome and Babylon for control of most of the Levant. Crete decided to expand eastward towards Turkey before going to the Peloponnesus. Early in the mid-game, Babylon decided to take a more aggressive position by purchasing military. Babylon based the decision on the wisdom of their financial advisor who noted the balance of trade was not balanced in favor of Babylon. Several other nations purchased military in response to the aggressiveness of Babylon. The purchase of military by Babylon changed the nature of the game to one of peaceful trade to one of sporadic warfare. Those nations that were closest to Babylon or who did not purchase military, Egypt, Thrace and Illyria, became the unwilling victims to the pillaging and looting of their cities from other players. In the later part of the game, Africa and Iberia became the noticeable leaders in the race for national supremacy. Babylon organized attacks on Africa followed by attacks on Iberia to try and stop the advance of these nations. The multi-national attack on the exposed coastline of Africa took its toll and delayed its advancement. Iberia proved a more formidable opponent to the voracious enemy hordes. Iberia fought the warmongers to a standstill on their heavily fortified and well defended shore and continued to advance their civilization to the winning position. Congratulations to Harold Henning for his excellent play as the stalwart leader of the Iberian people. The Advanced Civilization Tournament this year had a better distribution of winning nations. This year differed from 2003 when the winning positions were equally split between Iberia and Babylon. The following table gives you a detailed summary of the final position of each nation in each game. Expect a few changes to the 2005 tournament which primarily will be based on feedback from players. Seating assignment will be totally random for all players including those that bring their own game. The kicker or bonus score will be a measure of "robustness" of a nation and will be related to the number, type, and severity of calamities endured by a nation. Also, players will turn in a score sheet with all the calculations completed to expedite answering the most often heard question "Am I in the final". And, lastly, I hope that next year will see the return of some old stalwarts of this tournament, Joe Lux with his new winning strategy, Charlie Hickock a previous GM and Eric Gundersen, a previous champion. This year the record for best historian goes to Kevin Brownell. His history of the ancient world was the most colorful and is rendered here for your appraisal. Iberia and Assyria were the first to build cities in Rome and Sinope. Tensions building between Assyria and Babylon. Crete opts to occupy the Peloponnesus.War occurs between Assyrian and Babylon in Antioch. Assyria wins. City building explosion in Egypt and Babylon. Babylon buys engineering as his first advance but is two behind on the AST. End of the early Bronze Age see deadly calamities. Barbarians ravage Iberia, famine strikes Assyria, epidemic in Babylon, flood in Egypt and civil disorder in Thrace. Much wailing and gnashing of teeth was heard throughout the lands. Iberia suffers civil war in 800 B.C. with a large Babylonian faction taking over large portion of Italy. Once again epidemic spreads from Thrace which also suffers a flood. Assyria has finally restored his civilization after a disastrous series of calamities. After a burst of civilization in Babylon which saw them reach 1000 points, a disastrous civil disorder and iconoclasm left every city but one in ruins. Only Jericho didn't fall down, how ironic. 500 B.C. saw the great battle of Miletus in which a huge Assyrian army sacked the Cretan city and put its citizens to the sword. Babylon demonstrated its resilience by increasing by eight cities in one turn with the help of the Egyptian civil war. Assyria attacks the Thracian city of Byzantium preventing the rebuilding of a city. In 350 B.C. Thrace counterattacks Troy and sacked it in the Trojan War. Assyria attempted to sack Moesia but were defeated in a battle outside the city. The brutal assault on Thrace was unleashed with every nation participating. Several cities were sacked but Thrace survived and ran out the AST. 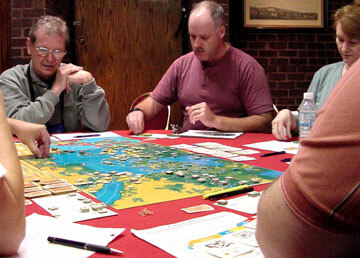 With a huge last buy of advances Babylon came with 780 points of cards to win over Thrace by 300 points.